What is a head cold? Symptoms, causes, cures and when to see the doctor. A head cold occurs when cold symptoms are more focused around the head and facial area. This can result in inflammation in the ears and sinsuses, leading to symptoms such as sinus headaches, temporary deafness and earache. 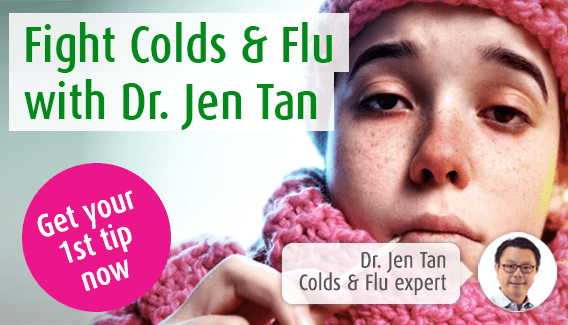 Here, our immune system expert, Dr. Jen Tan explores the underlying causes and symptoms of a head cold whilst recommending the best herbal solutions available to relieve your suffering. What is a head cold? A head cold is basically the common cold. It gets its name because the symptoms tend to be centred around the head and facial region more than a usual cold would. Head colds generally last between a week and ten days, and often the symptoms are manageable without medical attention. What are the symptoms of a head cold? With a head cold, the virus primarily affects the nose and sinuses. A head cold follows the same pattern as a normal cold, although the symptoms affecting these areas of the body are more pronounced than usual. As with a normal cold, symptoms last for about one week and it is unusual for complications to arise. However, the likelihood of sinusitis and ear infections slightly increases with a head cold. What causes a head cold? The bugs responsible for head colds are the same viruses causing the common cold. However, they appear to have a greater tendency to give rise to symptoms in your sinuses, head and face. The cold virus can be found in droplets in the air, on surfaces and in unexpected places such as petrol pumps. Only once the symptoms present themselves will you be able to tell if you have picked up a normal cold or a head cold. There are certain measures you can take, such as washing your hands regularly, which will reduce your chances of being infected by a cold virus. As with the common cold, there is no cure for a head cold. However, there is a variety of remedies which can ease your symptoms. As a head cold targets the head and sinuses more than an average cold, remedies such as nasal sprays to help with a blocked nose and painkillers to help with headaches may be useful. To treat the underlying viral infection causing your head cold, use an Echinacea extract to help relieve symptoms. It works on the immune system and also has anti-viral and anti-inflammatory properties. TIP: A head cold has the same cause as the common cold so using Echinacea drops or tablets will help relieve symptoms and strengthen the immune system. Head colds tend to lead to nasal congestion or a blocked nose. This in turn can give rise to inflammation in your sinuses or ears and a general feeling of being all ‘bunged up’. A nasal decongestant can help ease these symptoms and get you breathing freely again. TIP: A menthol based nasal spray can help a blocked nose caused by a head cold. Unlike other types of nasal sprays, it can be used for up to 30 days if necessary. If your head cold is accompanied by a sore throat, use Echinacea in combination with Sage. It is very unlikely that you will need to seek medical help for a head cold. However, you may need to seek medical advice if you develop a complication such as sinusitis, or if your asthma worsens. As with all illnesses, if you are worried about your condition, make an appointment to see your doctor.